The EOTech 512.A65 is one of the most popular short target holographic sights on the market today. Meant as a high tech replacement to iron sights, the EOTech 512 has rocketed in acclaim thanks to its ease of use, high accuracy, and durability. The first thing you’ll notice about the 512 is its box. Durable, attractive, and weatherproof, the case alone places it above some competition. The optic also ships with a full manual (explaining installation, use, and care) and a cleaning cloth for its lenses. Installation is simple (and universal to most modern weapon systems), consisting of mounting the unit to either a 1″ weaver or Picatinny rail. Once the screws are locked in the unit is surprisingly secure, with none of the wiggle sometimes seen in other, cheaper, optics. This solid setting is important, as it also eases the job of sighting the weapon, and improves overall accuracy. The 512 runs off two standard AA batteries (600 hours if you use bog standard store brands). This is, however, a double edged sword. While the use of standard AA batteries means that replacements are cheap, easy to find, and plentiful, it also means that you’ll be swapping batteries more often than with some other brands. The sight does have a low power indicator, and adding a spare set of batteries to your kit shouldn’t be too much trouble. The 512 also has more features than most other optical sights, including adjustable reticles and brightness settings. Experienced shooters who’ve fired with other optics may be surprised at the 512’s versatility, its many brightness settings all but ensure that no matter the light conditions your sight will still perform strong. The only (admittedly minor) complaint about the sight’s lighting is that it lacks night vision compatibility. While this won’t be an issue for almost all civilian shooters, military or police customers may still want to take it into account. EOTech does make other sights that do possess night vision though, so look into those if night vision use is one of your buying factors. The 512 was designed for (and indeed performs best at) short range engagements and target acquisition. Once properly mounted the sight helps place bullets with pinpoint accuracy out to around 50 yards. Even inexperienced experienced shooters often find that they can put rounds on target in under a few seconds at these shorter ranges. Within these ‘bad breath’ zones the 512 allows for extremely rapid shooting, and hits targets with great regularity (making it a great choice for courses that permit dynamic movement). Keep in mind that it’s important to suppress the natural instinct to close one eye while aiming an EOTech. The 512 especially, is made for use with both eyes open, as this superimposes the reticle over your vision. As no two firearms are exactly the same, it’s critical that shooters use short range shooting to dial in their sighting with the 512. While this becomes less of a concern with modern weapons platforms (most notably the AR-15), older firearms may need some work to find their ‘sweet spot’ within the optic’s target circle. Once zeroed the 512 is remarkably secure, and almost nothing short of severe damage or total removal will shift the sight’s picture. It’s only when one gets into the longer ranges that the 512 shows some of its weaknesses. At 100 yards (and up) skill will start to count more and more, requiring compensation on longer shots. If you possess some moderate training and skill, shooting within 200 to 300 yards should still be easy, and your greatest problems will most likely be wind speed and the drop of your bullets (depending on caliber of course). Shooting at even greater distances will require greater skill, especially as the optic’s range tops out around 400 yards. The 512 possesses a higher price point than much of its competition, and most buyers should expect to pay somewhere around $500. While other sights can be had for cheaper, almost none can match the versatility, stability, and durability of the EOTech 512.A65. The 512 is one of the preferred models for military and law enforcement around the world for good reason. Professionals the world over will gladly say they’d trust EOTech products with their life, and many do. The 512’s higher price reflects its quality, and it’s important to note that EOTech is famous for their generous and speedy customer service (especially for manufacturing defects and repairs). Most firearm dealers will allow you to play around with a demo version of most optical sights, so you should always ask your dealer for a quick presentation. 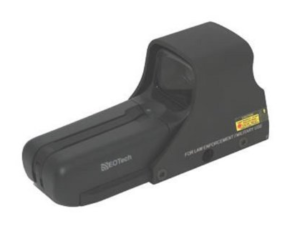 If the 512 is lacking some feature or detail, browse the entire EOTech catalogue, as they manufacture a wide range of optical sights to fit every need/role.